Photographer(s) Appreciation: Another thank you to Bruce Brethauer (aka Glochidman@Flickr) for these beautifully-photographed images of Stellarioides tenuifolia buds and a flower. Researching this species was difficult, since I was not sure which name to use. 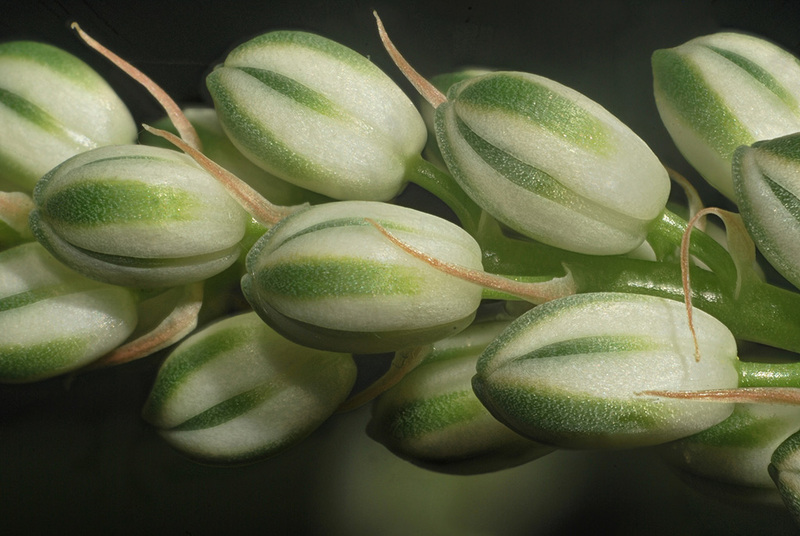 Until fairly recently, the flowering herb shown today was known as Ornithogalum tenuifolium. This is the label given on an early 19th century botanical illustration by Pierre-Joseph Redouté, and the name seems to have been valid until the current century. In 2009, John Manning and his colleagues used DNA sequence data to reclassify this species as Albuca virens. This name was quickly contested in 2011 by Martinez-Azorin et al., who found two clades within subfamily Ornithogaloideae (Hyacinthaceae), rather than Manning’s three. Martinez-Azorin recognize today’s species as Stellarioides tenuifolia, based on morphological features including small flowers on dense and many-flowered inflorescences. These flowers later yield small capsular fruits. Stellarioides tenuifolia is a bulbous perennial found from the eastern cape of South Africa to tropical Africa. It has few to (more often) many linear leaves that begin to develop during the flowering stage. 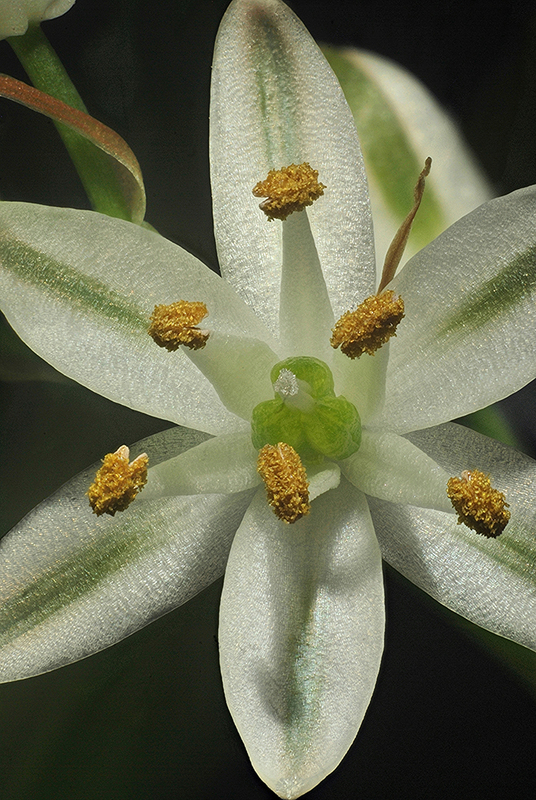 The flowers of Stellarioides tenuifolia are white to yellow with a green line along the centres of the tepals. This green line is visible on the flower buds of today’s photo. As per the morphological features noted above, the flowers are held on a long-stemmed compact inflorescence, with the eventual capsular fruits bearing 5mm-long seeds. One unusual feature of Stellarioides tenuifolia cannot be seen from a photograph. This species has the lowest chromosome number known to-date in the plant world. Monica Ruffini Castiglione and Roberto Cremonini (PDF) explain that chromosome number is one of the most basic factors in reconstructing phylogenetic relationships. The lowest possible chromosome number is 1 (n=1, or 2n=2 if diploid), which occurs in only a couple species (e.g., male ants of Myrmecia pilosula). By contrast, the fern species Ophioglossum reticulatum has the highest number of chromosomes currently known at 2n=1440. Stellarioides tenuifolia is one of only six plant species known to have the second-lowest possible chromosome number, 2n=4. Castiglione and Cremonini explain that current theory posits that evolution favours ever-larger chromosome numbers, meaning that species with extremely low chromosome counts are “relicts conserving the karyotype of ancestral eukaryotes“. What beautiful texture on the petals, and it’s just about possible to count the pollen grains! Really interesting reading, too, about the chromosome numbers and the significance. Great picture. Which lens did you use? Fabulous photos and very interesting article. Wow, these are incredibly beautiful! And what great photos! What’s not to like about this unusual species? The chromosome numbers info is really interesting. I also use double reverse lenses to increase magnification – it involves mounting a second lens to the front of the primary lens – (in much the same manner that people use a loupe to examine gems, insects etc.) My primary lens is an old Vivitar 90mm macro lens which predates the digital revolution in photography – I acquired it used more than 20 years ago, and it has served as my primary macro lens ever since. The secondary lens was either 135mm Rodenstock enlarging lens or a 187mm enlarging/graphic arts lens which I acquired during my years in the printing industry (when the printing industry went digital, the graphic arts cameras which were once the work horses of the industry became obsolete, and lots of really fine lenses were literally throw away).